Digital transcription by Tom McFarland in February 2000 from material in an old scrap book owned by Carroll (Illian) Flood of Grayslake, Illinois. The scrap book was maintained by Louise (Landis) Allyn, John William Landis, their mother (Alice Louise Cox), and perhaps others between 1880 and 1920. Additional information similar to the contents of this scrapbook may be be found among NOTICES and OBITUARIES. This scrapbook was contained in a music box initially owned by John William Landis. Poem Autumn Days "for the Chicago Tribune"
Landis - Cox - In Chicago at the residence of the bride's parents, Mr. & Mrs. A.M. Cox, Thursday, Jan. 4th, 1877, by the reverend Dr. Young,	Mr. J. Wm. Landis and Miss Alice O. Cox, all of Chicago. The happy couple are taking their bridal trip to Baltimore, Washington, New York, & other places east. The most cordial wishes of hosts of friends in Sandwich, will attend the bride. Landis - Cox - Thursday, Jan. 4th, at the residence of the bride's parents, 302 Orchard st., by the reverend Dr. W.C. Young, Mr. J. William Landis and Miss Alice O. Cox, daughter of Maj. A.M. Cox. A printed card "Happy New Year 1879" with printed names "W.G. Adams, J.W. Landis, Dr. C.H. Adams, J.B. Tucker, and W.C. Phelps"
The funeral of Dr. Edmund Landis, whose death occurred last Saturday, took place yesterday afternoon from No. 167 Howe Street, the late residence of the deceased. About the velvet covered coffin were many fragrant tributes. The funeral service was opened by a hymn, which was followed with prayer by the Rev. H.M. Collison, pastor of the Fullerton Avenue Presbyterian Church, the sanctuary attended by Dr. Landis prior to his death. The sermon was delivered by the Rev. Jeremiah Porter, who is said to have preached for the first sermon ever delivered in Chicago. He sought to comfort the bereaved family, who had been so suddenly deprived of a husband and father. The deceased had been, he said, an honest and faithful adherent of Christianity during his lifetime, and this should be a source of great comfort to his sorrow-stricken family, whom he asked the Lord to comfort in their bereavement. Jesus would comfort them as he comforted Martha and Mary, by saying, "Thy beloved will rise again," but it would not be until the day of resurrection. After the solemn services were concluded, the remains were followed to their last resting place, Roshill cemetary. The pall bearers were Mssrs. Rappley, Ellinwood, Davis, Oberne, Sievestson, and Dr. Simpson. 3 poems: "Shade and Sunshine", "Poet-tree", and "I can wait". 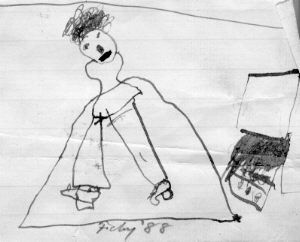 Drawing by a 2nd grade child, probably Alice L. Landis's daughter Louise, who was born in 1884. In January 2002, Rosehill Cemetery states Sarah Landis Maher died on 11 March 1903, buried in Section 113, lot 124, south ½. It is not known why Sarah's obituary was included in this scrapbook, other than for the name "Landis". There is only one Abraham Landis known in our branch of the Landis family, and this man would have been 77 years old in 1830, when Sarah was born. 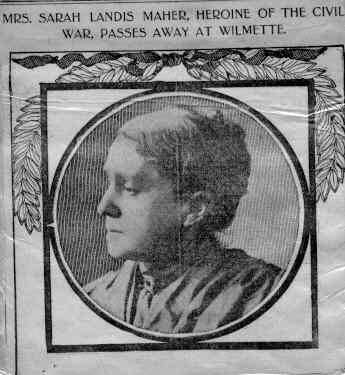 Mrs. Sarah Landis Maher of Wilmette, heroine of the civil war, died yesterday at the age of 73. She was the daughter of Abraham Landis of Lancaster County, Pennsylvania, the first prominent member of the famous Landis family of that state. Her husband, who died last December at Wilmette, at the age of 87, was a construction chemist, and erected the first sulphuric acid plant in the United States in Philadelphia in 1842. He also erected plants in California and Chicago in the early '50s. 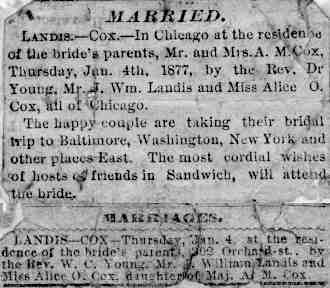 A card appearing as if it once bore an attachment, reading "Mr. & Mrs. J. William Landis" across the top, and "Chicago, January 4, 1877" at the bottom. Given the above notice, this probably served as admission to their wedding on that day. A pair of stereoscopic photographs of what appears to be the office of Dr. Edmund Landis. 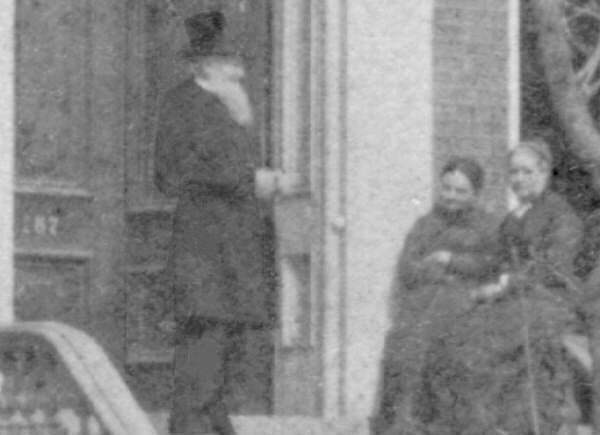 At the right is an enlargement of the right doorway of the photo above, showing Edmund Landis, his wife Hannah (probably left, with darker hair), and possibly the wife Alma (Moore) of his son Edmund M. Landis (right with lighter hair). Compare the house number with the address "167" given in his obituary above. Late portrait of Edmund Landis Sr.
A business card, of sorts, hand-signed "Dr. E. Landis". A burlington Route railroad ticket signed "J.W. Landis"
Landis - J.W. 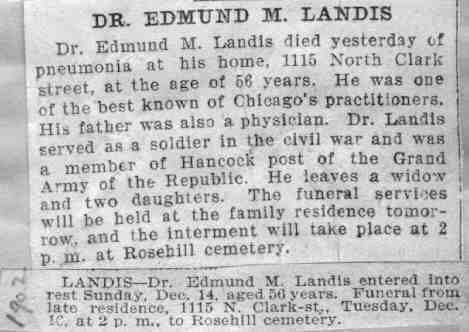 Landis, July 22, 1921, Lombard, Ill., beloved father of William W. Landis and Mrs. Louise Allyn of Delevan, Wis. Funeral Saturday, Jult 23. Burial at Rosehill. A humorous story in fake Brooklyn dialect, hand dedicated to Chicago baseball. A singing concert programme and a humorous poem "A crazy editor's Dream"
Sandwich, Ill. Feb 8 - Chief Engineer Henry S. Davids of the United States Navy, on the retired list, died at the home of his sister, Mrs. A.M. Cox, in this city this morning. Henry S. Davids was born at Fishkill-on-the-Hudson, N.Y., April 4, 1839, and entered the United States Navy at Norfolk, Va., when about 18 years of age. He was in South America at the beginning of the war, but, returning home, was in active duty the entire period of the war. After the close of the rebellion he was stationed for a number of years at Mare Island, California - until, about five years ago, he was placed on the retired list, owing to ill health. He leaves one daughter in good circumstances to mourne his death. We have tried to notify you that you are the possessor of the music Box we were to give some customer as a Christmas present - We believe you are the lucky party. Please call for same as we are short of help through sickness. Please bring some nickels with you. 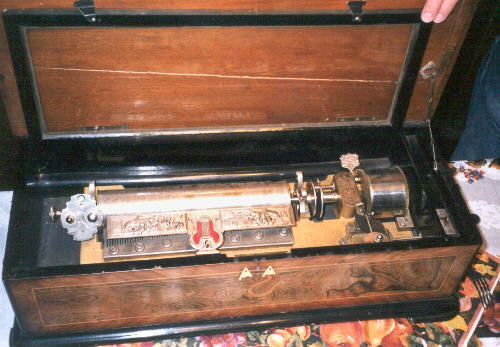 The magnificent music box that for some time has been on exhibition at C.W. Lapham's shoe store at 329 Madison st., and for which each person who purchased $1.50 worth of shoes received a numbered ticket, was won by J.W. 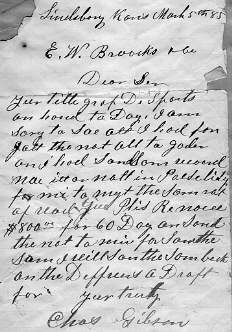 Landis, a s. Water-st. lumber merchant, living at 2542 Cologne St., the number being 6375. J.W. Landis, Manager at Merrill. J.W. Landis has resigned his position as local manager for the Wisconsin Valley Lumber Company, in this city, and accepted a like position - with the addition of an interest in the business - with the Watkins & Fuller Lumber company of Chicago, to take effect on or about the 10th of January. Mr. and Mrs. Landis have been among us only about a year, but during that time have made many friends, all of whom enter a protest against their removal from our midst. The best wishes, however, will accompany them to their home in Chicago. newspaper copy of Bryant's "Thanatopsis"
A notice that "Mr. and Mrs. H.A. Cox have returned home Monday from their bridal trip. Lon says, 'it's business now', especi..." (the notice is not complete). "H.A. Cox" is named in the obituary of his sister Ella as brother to Alice. Henry A. Cox married Fannie Hummel on 1 January 1886. "Lon" is apparently a nickname for "Henry Alonzo Cox". 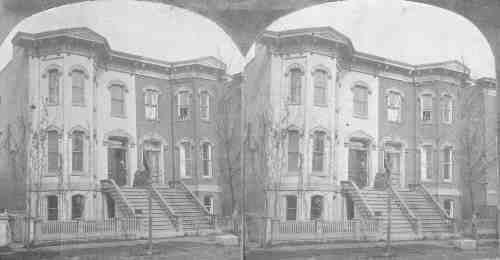 In the Weir album, at about age 10, he is identified as "Lonny"
a ticket for the World's Columbian Exposition in Chicago, dated 1st May to 30th Oct 1883"
Dr. Edmund M. Landis died yesterday of pneumonia at his home, 1115 N. Clark street, at the age of 56 years. He was one of the best known of Chicago's practitioners. His father was also a physician. Dr. Landis served as a soldier in the civil war and was a member of the Hancock post of the Grand Army of the Republic. He leaves a widow and two daughters. The funeral services will be held at the family residence tomorrow, and interment will take place at 2 p.m. at Rosehill cemetery. a photo and drawing of a school, and a third drawing of that school appearing to be in ruins, perhaps after a fire. All three are from Chicago/Hinsdale area newspapers. A short piece of advice: "Do not keep the alabaster box of your love and tenderness sealed up until your friends are dead. Fill their lives with sweetness. Speak approving, cheering words while their ears can hear them, and while their hearts can be thrilled and made happier. The kind things you mean to say when they are gone, say them before they go. -- George W. Childs"
Attached to this advice is a faded photo of 10 boys and a counsellor, annotated on back: "taken by Lutenant Thorn, presented to W.W. Landis for the ammount of 5 ¢ on Feb. 21st 1902, Racine College, Racine, Wis." Ralph Gilman Thorn is on a list of 1901 Racine College students. Adams - Alice L. Adams, March 24, Washington Park Hospital, dearly beloved mother of Louise Landis Allyn of Delavan, Wis., and William W. Landis of St. Paul, Minn., interment Wednesday, March 26, 3 p.m. at Delevan, Wis.
A message with the theme of death, printed on the back of a card from Lewis' at 96 Dearborn Street, Chicago, which might have been part of a funeral. 3 photos of the J.W. 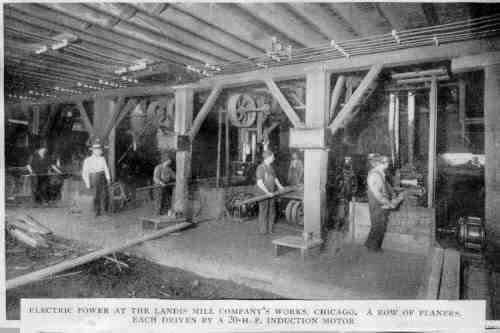 Landis Mill Company at 26th and Throop Sts in Chicago, as well as a 2-paragraph article describing the mill. It is possible that this photo shows J.W. Landis (white shirt), but with insufficient detail to recognize. In a syndicated article called "Lyrics of the Day", a poem called "Songs in every tree" with the theme "let's be friends", and hand dedicated "To W.L. from H.C. 1922"
A moralistic essay on the value of caring about what you do in life, and the cosequences of not caring. About 37 pages were unused. Enclosed loose in those unfilled pages were a humorous article on Irish names, and a photo of two boys in school uniforms, annotated on back "apl 1903". 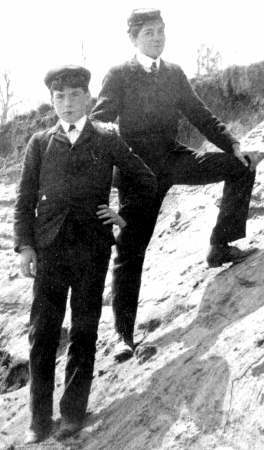 One of those boys would be a 15-year-old Wm W. Landis, probably on the right; the other boy may be Bud Nixon, a good friend in school. The boy is visible in the high-resolution image of the 1901 Racine college class, second row right side. The site is probably the "lake bank" referred to frequently in a diary kept by William Landis while he was a student at Racine College.